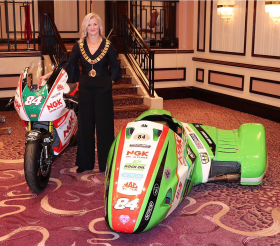 MARIA COSTELLO MBE is determined to raise the profile of the TT Riders Association after being unveiled as the organisation’s first female president in its 67-year history. The Northamptonshire racer was handed the chain of office at the association’s annual luncheon at the National Motorcycle Museum in Birmingham. The TT Riders Association is the only Isle of Man registered charity in motorcycle racing and helps racers and their families when they have been injured or have fallen on hard times. Costello, who was made an MBE in 2009 in recognition of her career as one of Britain’s leading female racers, assumed the presidency from Richard ‘Milky’ Quayle, who is one of only three Manxmen to win a TT. Other holders of the prestigious role have included Charles Mortimer, John Surtees MBE, Joey Dunlop OBE and Nick Jefferies. The inauguration luncheon was a great success with more than £10,000 raised from the auction. Costello’s acceptance speech was well received by a supportive audience as she started her term as the first female president. Costello says that she is thrilled to be the first female president and added: “I may be the first woman in the role, but I hope many more female racers will follow in my footsteps.